Well, I did it again. The judging for the 2018 state fair jewelry competition just finished, and I picked up another blue ribbon. That’s 4 years in a row now. I’ll post a picture of the bracelet with its ribbon once the fair opens and I can take the picture. I have my bracelet ready for the 2017 State jewelry competition, which will be held during the state fair. So far, I’m 2 for 2 with blue ribbons. 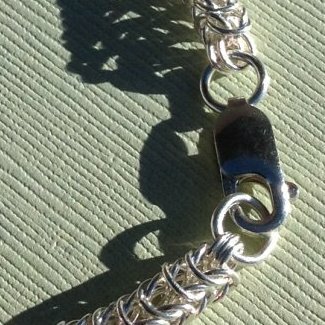 This year, I’m submitting a fantastic bracelet featuring the dragonscale/ mermaid weave. This advanced design has larger rings on the outside that face one direction and smaller rings on the INSIDE that face in the opposite direction, creating the appearance of fish (or dragon) scales. For the outside rings, I used sterling silver (18 gauge, 6 mm inner diameter) rings. For the inside rings, I used 14k gold fill (20 gauge, 4 mm inner diameter) rings. The final result is absolutely stunning! I’m really pleased with how the gold inside rings complement the brighter silver rings and give the entire piece a deeper, richer appearance. I will submit the bracelet on August 26th and find out the results a couple of weeks later. Wish me luck! I feel really good about this bracelet, and it would be nice to pick up another ribbon. On a side note, I have a little of the gold fill wire left over. 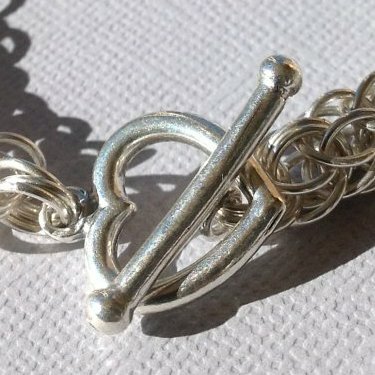 I’m thinking about making another lovers’ knots bracelet to use it up. It might make a nice Christmas present for my niece. In 2014, my girlfriend at the time and I visited the Creative Arts pavilion at the NM State Fair and checked out the bead work and jewelry competition. She is an amazing artist with bead weaving, as good as or better than anything we saw at the competition. I encouraged her to enter in the following year (this year, now). And then I saw the chainmaille competition pieces. 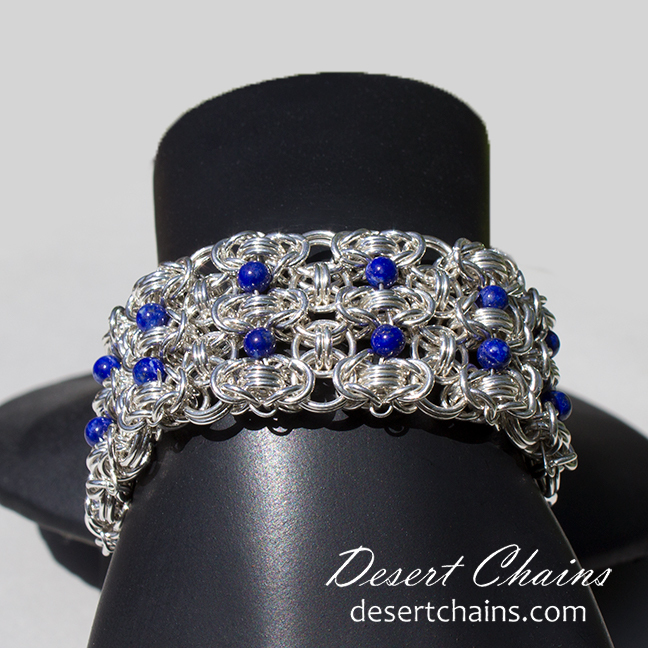 The blue ribbon winner was a pretty and sweet bracelet in the helm maille weave. 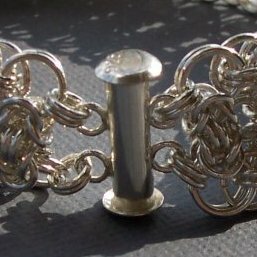 It’s a nice design, but it’s definitely a beginner’s chain maille weave. I thought I would like to enter the competition, too. For the second year now, I entered the NM State Fair Jewelry Competition. And for the second year, I received first place. Last year, I submitted a sterling silver Viperscale bracelet. It was the first time I had made that design, and the first time I had seen it in Sterling Silver. Quite honestly, I was a little surprised that I won first place, but I was very pleased, too! It’s a beautiful design. Made for a man who knows what he wants.